Constructed from lightweight and durable thick foam laminated fabric mesh. Fixes in either left or right arm. Minimizes chance of future injury. Inconspicuous and comfortable to wear. 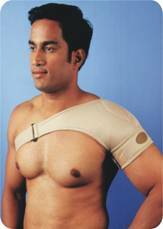 Unique support guides and centers the gleno-humeral joint promoting mobility but inhibiting rotation.